Are you looking for an opportunity to make a charitable contribution to families in need this holiday season? The Santa Cop program, which provides toys and clothing to families in need, is in full-swing–and we need your help! How can you contribute? Well, there are toy drives across the City where you can drop off an unwrapped toy for a child 12 years and under, you can make a financial contribution (Santa Cop is a 501 (c) 3 non-profit organization), you can help sort and set up the Toy Store where presents will be given away, and you can volunteer to help wrap presents. 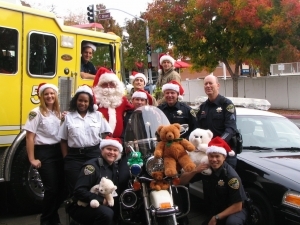 The Santa Cop in San Rafael is sponsored by the San Rafael Police Department, the San Rafael Fire Department, the San Rafael Police Association, the San Rafael Fire Association, and International Footprint Association Chapter 15. For more information, visit the San Rafael Santa Cop website.